Sometimes I get called out for those little disasters that can happen. The photo's below show a wine stain that looked quite disastrous, what I call a spectacular. I was able to rinse away any prior treatments and then remove the stain following established procedures. I recommend calling in a professional carpet cleaner to deal with spots and stains. In an emergency please call us first, it may save you an insurance claim, my advice is free and we can discuss the best action to take. In general terms the following steps will help but before attempting this please call. The following is offered as a general procedure and is in no way definitive. I do not recommend attempting stain removal without calling a professional first and the following is carried out at your own risk. It is easier to remove a stain in its original state whilst it is still wet, so please call first before you take any action . Once a stain is dry it can become permanent, particularly with dye stains like wine. There are a range of treatments specific to each task and stain we have available to us and the equipment necessary to remove residues and neutralize treatments. I always recommend removing any solids with a blunt knife or scraper and then blotting the stain with a pad of absorbent towels and absorbing as much of the stain as possible into the pad. It's tempting but do not rub the pile, it will push the stain deeper and could distort or burst the pile. Avoid stain removers unless it has been tested on your carpet. Some will lighten your carpet or even bleach them, others can leave a soap residue which will lead to the area attracting dust and re-soiling. If they are used test first, follow instructions and never use neat unless advised to do so. Washing up liquids, laundry detergent, bleach, disinfectants and oxygen washing powder additives are not suitable for carpet cleaning and can cause serious damage. Always use protective clothing and gloves and always follow manufacturer’s instruction and observe health and safety precautions. Some useful hints and tips. Always test any solution in an inconspicuous area first to check for colour or texture change. Never over wet and use solutions little and often. Blot well and dry between treatments. Work from the outside of a stain toward the centre. Use white towels or face cloths to avoid colour migration. Use laundered towels, they are more absorbent and it will ensure all manufacturing treatments are removed. Below are some basic solutions that can help with many basic stains although unfortunately not all stains can be removed. There can be a chemical reaction which may change colour and texture, dye stains in particular like ink, wine, tea, coffee and juice can be permanent. I will allways assess the damage and advise accordingly. Vinegar & Water Solution. Use 100ml white vinegar mixed with 400ml of water in a clean spray bottle. Ideal as a final phase and rinse for neutralising soaps. Surgical Spirit. Your local chemist may have this in stock but you will need to ask for it. Ensure adequate ventilation by opening windows and doors and follow manufacturer’s health and safety precautions. Solvents are more effective dry so use before applying water or detergents on oil based stains. Start here for tar, gum, paint spots, oil etc. Use a very small amount and introduce to a clean white towel and apply the towel to the stain, hold for 30 to 60 seconds. If there is no transfer of the stain to the towel do not apply again and allow to evaporate. 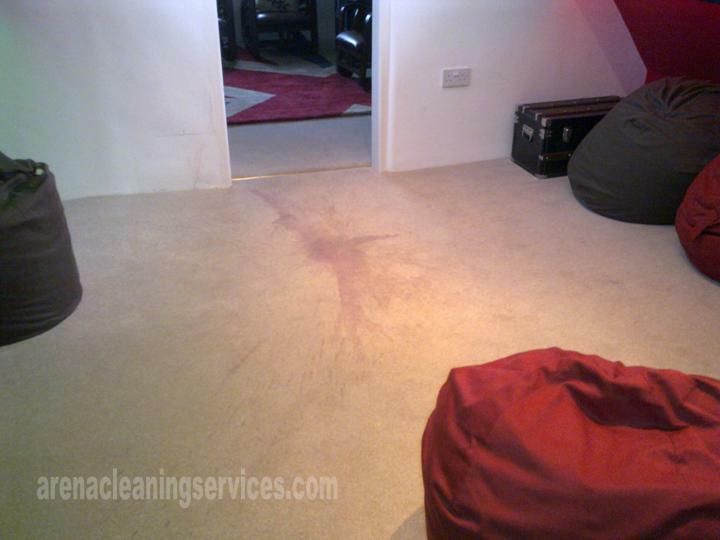 Never pour directly on to the carpet as it can cause severe damage. If there is transfer allow for evaporation and apply again until there is no further improvement. Use thedetergent solution as directed below in a spray bottle, blot dry then spray the Vinegar & Water solution. Use a dry folded white towel over the stain and apply weight, leave until dry, replacing towel as necessary. Apply plain water first. The aim is to dilute the stain and the best way is a spray bottle which will avoid saturation, do not over wet. You might also rinse a white face cloth in cold water and wring until damp and apply (add a weight or stand on towel). Allow 2 minutes then blot the area dry again. Keep going and remove as much staining as possible. If this does not work move onto a detergent solution. Detergent Solution. Use a large bowl or I prefer a spray bottle (rinse the bottle well and run water through the sprayer head to remove contaminates). Add 5ml or one teaspoon of detergent suitable for use on wool to every 300ml of warm water. Add the detergent to water to avoid foaming, gently shake or stir to mix. Spray the area allow 2 minutes then blot the area dry. Re-apply as necessary until there is no further improvement. Finally spray the Vinegar & Water Solution over the area then cover with a dry folded white towel and apply weight, leave until dry, replacing towel as necessary. Detergent & Vinegar Solution. Add 5ml or one teaspoon of white vinegar to the same detergent solution above. If the detergent solution does not work follow up with Detergent & Vinegar Solution. Spray the area allow 2 minutes then blot the area dry. Re-apply as necessary until there is no further improvement. Finally spray the Vinegar & Water Solution over the area then cover with a dry folded white towel and apply weight, leave until dry, replacing towel as necessary. Final Rinse. Use the Vinegar & Water Solution following use of all solutions above as a final rinse. Spray the treatment area and then blot excess moisture. Fold fresh white towels over the area and apply weight which will encourage more residue into the towel. 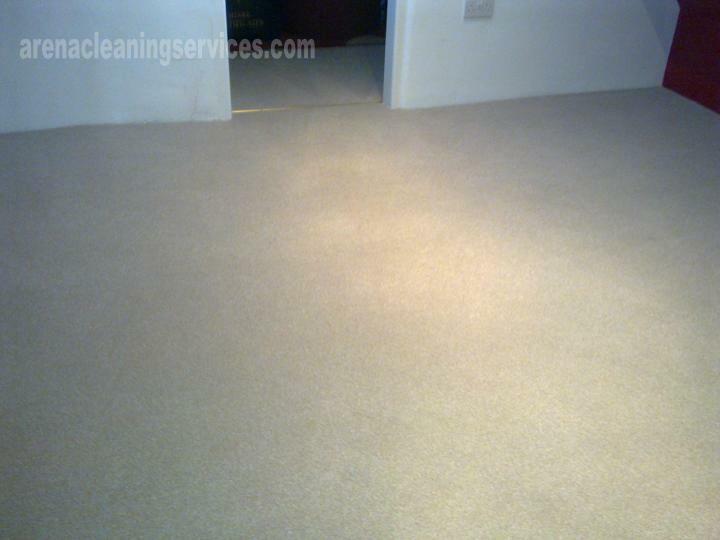 There are more specialist solutions available to professional carpet cleaners leave any further treatment to them.